Powers/Abilities: Dr. Kurarkill has extensive knowledge in genetics and engineering, as well as various scientific fields. It is unknown whether she designed and/or constructed her own equipment or had someone else do it for her. She also designed an electrical field able to restrain even Iron Man. 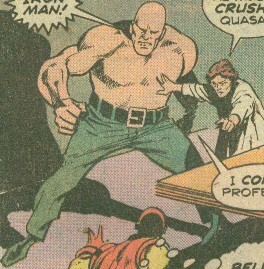 She has minimal physical skills, but she controlled Quasar and could also use the Neo-Apes against others. 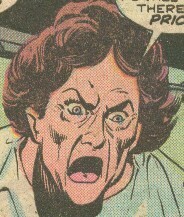 (Iron Man I#79 (fb)) - Dr. Kurarkill claims to have been a genius in genetics, but to have been forced into independent research when the scientific establishment laughed at her radical theories. She designed a device that could convert a human being into an ape; using the "Laws of Psychic Energy Conversion," she used the energy gained/taken from the formerly human subject to transform an ape into an intelligent man. Her first major success was with an ape-made-man, whose intelligence, etc. was increased by adding more energy drained from other people, who came to be her Neo-Apes, kept in confinement. When one of her assistants complained, she had her greatest success, now named Quasar, restrain her so that she, too, was drained of her psychic energy and transformed into a a neo-animal. Working out of Murder Mountain Lodge, she took the rare customer for her experiments. 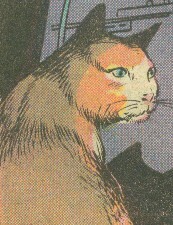 (Iron Man I#79) - Tony Stark had taken care of Carrie, Keith, and their new cat, Zero, whom he had rescued from a flood, stopping at the Murder Mountain Lodge when the rainstorm proved too much for travel. Carrie and Keith were quickly captured, but Stark became Iron Man and investigated, only to be beaten into submission by Quasar. All three former guests were restrained in Kurarkill's electrical field while she revealed her origins and her intent to make the three of them her test subjects as well. However, Zero wandered close to Quasar's pant leg, rubbed off some static electricity, and used this to disrupt the delicate electrical field, freeing the prisoners. Quasar again attacked Iron Man, who was prepared for his power this time, and used his skill and experience to defeat his foe. Iron Man leveled Kurarkill's equipment to stop further experimentation, while Zero chewed the insulation off of one of her wires. As a result, when Kurarkill tried to unleash her Neo-Apes against her former prisoners, the short instead caused the door from the animals' pen to open into her control room, and the creatures savagely attacked and apparently killed her. Comments: Created by Mike Friedrich, George Tuska, and Vince Colletta. So Quasar's been languishing in comics limbo for over 30 years...what happened to him after he was rehabilitated? Her name is pronounced like "Cure or Kill." An ape transformed into human form by Dr. Kurarkill, he was continued to be fed with further psychic energy, giving him brain and brawn beyond that of humans. He continued to act as the muscle for Kurarkill, defeating Iron Man on their first struggle, though falling before his superior experience and skill on their second fight. Iron Man promised to put the full resources of Stark International behind the moral education of Quasar, so that their would be hope for him outside of a cage somewhere. He was strong enough to beat Iron Man into unconsciousness, perhaps possessing Class 25 strength, with an appropriate balance of superhuman durability. Allegedly his brain power was far greater than human, though he didn't demonstrate anything impressive beyond just being a lackey. 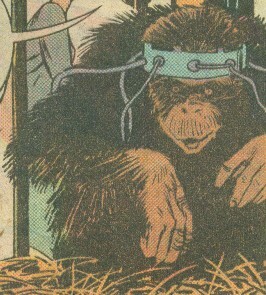 Humans devolved into ape-like form by Dr. Kurarkill's process, their former psychic energies being used to evolve other creatures, notably Quasar. It is unclear whether all men became apes and all women cats, or if that was something unique to the woman who became Zero. Though bestial, they retained some memory of their treatment at Kurakill's hands, and when given the chance, they took savage vengeance on her. Iron Man promised to put the full resources of Stark International behind caring for them, and hopefully restoring them to their former status. A couple, they had been visiting Keith's cousin Karen (and her bratty kid). After leaving, they found a starving cat, whom they adopted and named "Zero." The next day a powerful rainstorm caused their car to crash, and they were rescued by Iron Man, after which Tony Stark rented a car and took them to find a hotel. After several failures, they ended up going to Murder Mountain Lodge, where they nearly became test subjects of Dr. Kurarkill until being saved by Iron Man and Zero. A former assistant of Dr. Kurarkill's, she spoke out against the inhumanity of what she had done, only to be turned into one of the subjects herself. Transforming into a cat, she somehow escaped and was adopted by Keith and Carrie. 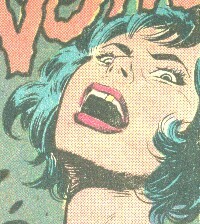 When Keith, Carrie, and Iron Man became captives of Dr. Kurarkill's electrical field, Zero rubbed up against cloth, generating sufficient static to disrupt the field, freeing the prisoners. Later, when Kurarkill prepared to unleash her Neo-Apes against her former prisoners, Zero chewed the insulation off of some of the wires from her equipment, causing a short that instead opened the door between the Neo-Apes and Dr. Kurarkill's control chamber. No one involved suspected Zero's true nature, and her subsequent fate is unrevealed.